Today, AniB muses on blogging! Some thoughts on the blogging experience so far. Another off the cuff post…how unusual for me. Today though, I guess I’m going to do an introspective blog post, which is really unusual outside of the 10 Thoughts columns I’ve started doing regularly on Mondays. However, this is more about just blogging itself, which is honestly something I haven’t sat down and talked about at all in all my time doing writing on here. 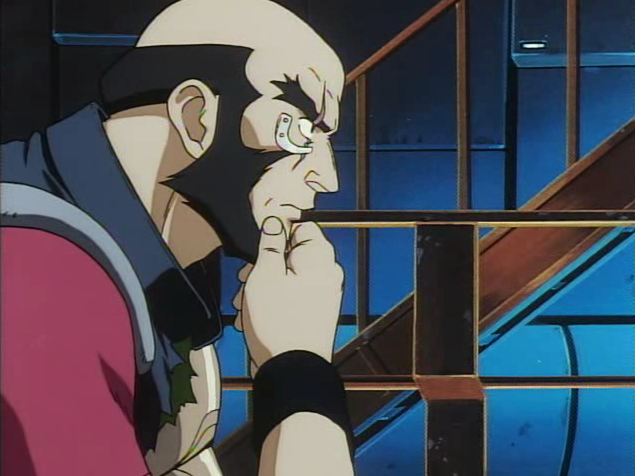 It’s been a hodgepodge of animation analysis, reviews, character pieces, the odd musing here and there, and hiatuses- but never actually about just the thought process and ideas of the writing that I’m doing at a given moment. So I figured I’d pull back the Wizard of Oz’s curtain a bit here, figuratively speaking, and speak candidly on where I’m at. 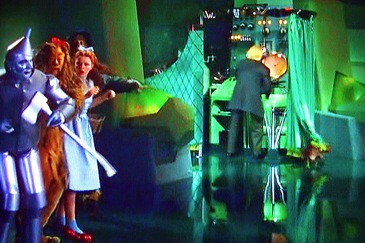 Dorothy and friends found an odd little man behind a curtain. The only thing you’ll find here are unfinished drafts, though. Sometimes, I’m plumb out of ideas at a given moment. That doesn’t mean that I don’t have show reviews waiting to be done, or other ideas that won’t be written about, but occasionally, the current moment just doesn’t bear something I’d just love to write about at that particular time. Other people really thrive on this type of piece I’m doing now- the off the cuff, informal “stream of consciousness” type post which can make for some fairly entertaining reading, but considering my own goals for this place, I tend to gravitate towards hard analysis more often than not. To that, I hope people a) like such pieces as I keep going forward, and b) makes me curious if they want more of the informal type posts, especially as the focus here is as my tagline says- “exploring the world of animation with a fresh, fun, critical approach.” I’d also be curious if anyone would like to maybe collaborate on something at some point, but so far, it’s been mostly solo riding here, with a piece or two from a friend of mine who’s also invested in the success of this place. Nagisa is here to assassinate “boring.” This also is an excuse to use an image in those sweet 3-E uniforms. Deku’s mumble storms are me when I’ve got an idea rolling along. Discourse and dialogue is a big goal of mine. Animation is a medium that needs a wider legitimacy among the masses, because it is a serious form that can tell amazing stories in a very unique way. Sitting down to write about then requires keeping this sort of goal in mind, among many other aspects that are considered, because while I know people who love anime or Western animation, or Pixar animation, or something from Bones will obviously be the core audience of what I do, I’m always thinking about the random stranger who stumbles upon this place. The hope is that they can be transported on a new journey to somewhere they never quite imagined existed, in the best of ways, and perhaps discover something that piques their interest. And for the staunch animation fan, I hope the writing I do sparks dialogue, inspires your own thoughts and writing, if you are in fact a blogger as well, and makes you think a little bit more about the medium as you carry along enjoying it. For everyone involved though, it’s always the best when someone discovers a show they never explored because of a review, or maybe gained a greater appreciation of some aspect of something they didn’t think about, or even if they disagree and eloquently tell me as much. It’s all part of the writing process, but also the realm of animation discourse that needs to happen, and it’s very exciting. Like what you see? Have a thought you’d like to say? Leave a comment! Author anibproductionsPosted on June 27, 2018 Categories 10 THOUGHTS, ANIMATION, BLOGGING, CHARACTERS, COWBOY BEBOP, NAGISA SHIOTA, ZUKOTags ANIMATION, ANIME, BLOGGING, COWBOY BEBOP, IZUKU MIDORIYA, NAGISA SHIOTA, THOUGHTS3 Comments on Today, AniB muses on blogging! All Might’s chosen successor and the future ‘Symbol of Peace.’ Who is My Hero Academia’s leading man? To keep the ball rolling on this series, and perhaps inspired in part by the previous two entries in the series that addressed characters who also were students, we now jump from Class 3-E and Nagisa to a class expected to be the elites of hero society- U.A. Academy’s Class 1-A, considered the best and brightest in Japan, with the burden of expectation that they can become the next great generation of society’s protectors. And who better to talk about then the main focus of the entire series in Izuku Midoriya, hero name “Deku”? In an unusual twist for the “What’s In a Character” series, Deku’s a character that is still very much a work in progress as his series is ongoing. However, there has been enough material about him at this point to start writing something compelling about his character, especially in the context of his very important role: that of the shonen protagonist. In that vein, Midoriya’s contrasting appearance is notable with that of Katsuki Bakugo, his childhood “friend” turned archrival. There are several thematic subversions that can be observed between the two, starting with the color of their hair. Traditionally, blonds are seen in fiction as “chosen ones” or “prince charmings” or something of that nature. Bakugou certainly believes he’s the latter, but he’s also no gentleman. 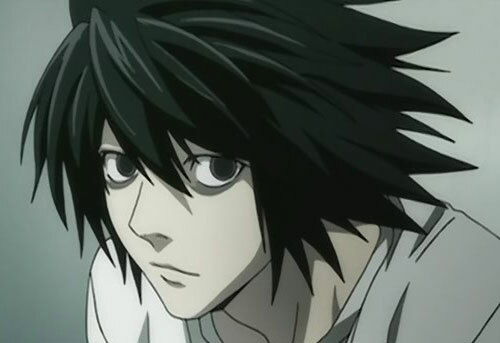 Deku’s dark hair suggests a fairly unremarkable character with no particularly interesting fate. Furthermore, to reinforce this thematic idea is that All Might himself has blond hair- and is a realized version of that great promise and potential fulfilled. In fact, the show makes it very clear from the start that Midoriya’s desire is not enough to overcome the obvious disadvantage of being Quirkless, or simply lacking the talent to match how motivated he might be. A curious note to the Midoriya-Bakugo dynamic is actually the perception of the two from their classmates in junior high versus how they’re viewed at U.A. Midoriya, for the first time in his life, finds himself quite popular among his U.A. classmates for both his earnest, kind nature, incredible resolve and detailed planning (though his mumble storms with the latter tend to backfire a bit for people.) Bakugo on the other hand, after being the king of the hill in high school, finds a similar position at UA with his talent, but not nearly the same kind of admiration at first due to his abrasive nature and generally angry tendencies. 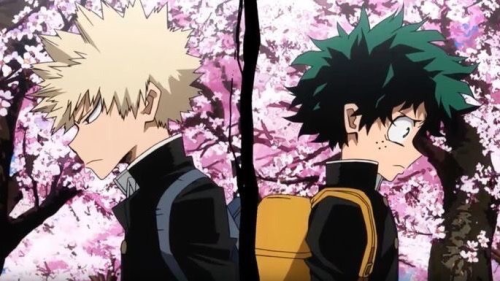 However, both Midoriya and Bakugo gain respect from their fellow classmates as the events of the story unfold, and the rivalry continues to bloom, with the explosive power of two rising heroes very much on two sides of the same coin, with two very different approaches yielding them results. Perhaps this simultaneous difference and similarity in approaches was never fully on display than when the rivals were forced to work together in passing their first semester practical exam, where they approached the difficult task of having to hand-cuff or escape through a designated gate from All Might (“Katsuki Bakugo: Origin,” season 2, episode 23). Forced into a situation where their clashing philosophies and individual strategies did nothing but put them at a disadvantage, it was here that both young men put everything on the line- even their rivalry for a brief moment- and came together to achieve a goal against the very man they aspired to be like in their own ways. Finally, it is interesting to note that Bakugo was the one to inspire the hero name of “Deku.” Literally playing off the meaning of “do/can’t do” in Japanese, he uses the nickname as a way of taunting Midoriya, reminding him that he won’t amount to anything. However, when the latter meets Ochaco Uraraka, she actually tells him that “Deku” was a great name, giving off the vibe “of a hero that can do anything!” And so, with a renewed outlook, Midoriya embraced the name, something which truly infuriated his rival considering the original intent. One For All as a Quirk in My Hero Academia isn’t just an incredible power, but also a narrative framing device for all of Midoriya’s actions once he earns the right to hold that flame. The old saying “with great power comes great responsibility” rings truer and truer as Midoriya continues to slowly get stronger, eventually gaining a small level of control over his amazingly powerful Quirk- while All Might grows weaker, highlighting that Deku’s control of his power is actually on a clock- a race against time only intensified by the emergent League of Villains and an anti-Deku figure- Tomura Shigaraki, whose relationship to the mysterious All For One is a bizarre inverse of Midoriya’s chance All Might encounter. For Deku and Tomura, both have been given a path to change the world- but whose path will shape the future is now an increasingly tenuous question as the series continues on. Indeed, everything comes to a head when All Might and All For One engage in their long-foreshadowed rematch, and it is at this moment that both sides officially pass the torch on to their fated successors- as All Might fights and wins with the dying embers of his Quirk, and All For One’s defeat leads to his arrest by the authorities, moving both men out of the picture as events move forward. Deku’s steady but slow growth in learning to control his Quirk occurs at a believable pace within the framework of the story. In a well-done twist, he first has to train his body to receive One For All, but upon gaining it from All Might, he’s able to tap all that power-but incurs a serious cost on himself. After literally breaking himself on a number of occasions, he gradually begins to learn how to control the powerful Quirk he was gifted after the aforementioned training internship with Gran Torino. While it’s my intention to not dive into manga spoilers for the anime-only viewers, Deku’s power continues to develop concurrently with his own self-discovery of his own style. What Midoriya comes to realize is that while striving to be the #1 hero is is goal, he’ll have to be his own man in doing so- and making One For All his own Quirk, rather than mere imitation of his mentor and idol proves to be an extension of that important lesson. Undeniable yet still is Midoriya’s effect on those around him not named All Might or Bakugou. He manages to start making a skeptical Aizawa a believer in his power with a simple ball toss test (“What I Can Do For Now”, season 1, Episode 5), is the first to draw out Todoroki’s fire side during the U.A. Sports Festival (and in turn, trigger a healing process for that boy; “Shoto Todoroki: Origin”, season 2, episode 10), and even shows the so-called “Hero Killer” Stain enough resolve and conviction that the villain, despite being recently beat by Deku, Todoroki and Tenya Iida, has enough tenacity to save his enemy’s life when he is snatched by a Noumu. (“Climax,” season 2, episode 17). 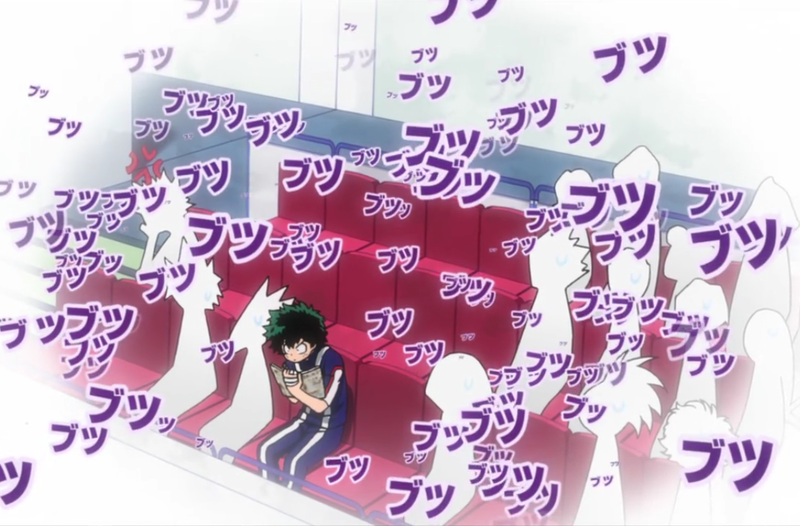 It is also Midoriya’s example that inspires a small group of his fellow classmates in the daring rescue attempt of Bakugou after the League of Villain’s successful infiltration of the summer camp, and prior to that, he becomes an embittered young boy’s (Kota) hero in a life-risking battle versus the villain Muscular (“My Hero,” season 3, episode 4.) It is examples like these that in individuals ways, show just why Midoriya was given One For All, as he’s shown a profound ability beyond merely powerful punches and kicks to change hearts and minds, backed by his own conviction in his ideals. 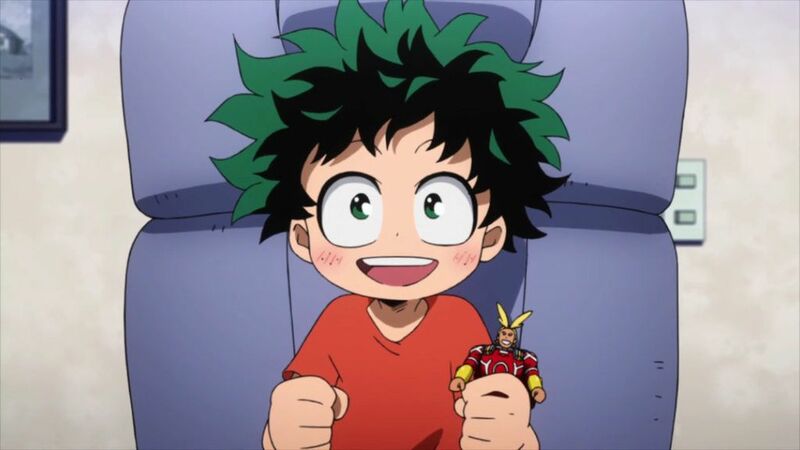 Little Deku is already the best. Truly adorable. Like what you see? Big fan of My Hero Academia or Deku? Leave a comment! See Deku’s face? Welcome to AniB’s stab at an interesting request. Well, it finally happened. I got a request to write about an anime harem that I’d pick according to these rules set here and well…I guess you could say challenge accepted! First off, thanks to The Luminous Mongoose for the nod to do this piece. His blog is here if you wanna check it out, and he writes some quality, fun anime pieces. I wrote a while back about Killua Zoldyck, and while he’d be an obvious choice for this exercise, given that he’s my favorite anime character in existence, it turns out that for this specific “harem” his best friend Gon was actually a better fit. Gon is the paragon of determination in a character. He won’t quit to achieve his ends, even if his recklessness could cost him his life- a price he comes all too often close to paying. However, there are few characters in anime with more conviction for their goals than the young Hunter, and even fewer that are willing to suffer, even greatly, in order to achieve them. I thought carefully about this pick, but the brothers represent a very deep sort of brotherly love that is inseparable in the quest to regain Alphonse’s lost body. They are tasked with fixing a grievous wrong that was self-inflicted, but in turn, find themselves wrapped into immeasurable danger as their quest to find the so-called “Philosopher’s Stone” continues to get darker at every turn. 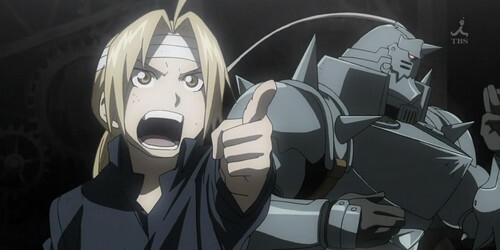 Edward in particular is driven to ensure his brother’s survival, and is shown to be selfless in his pursuit of regaining his brother’s lost body. So why in the world would I pick Karma? At first glance, he doesn’t seem like a good fit for this type, but then you take a deeper dive…He’s a genius with a streak of frighting crazy behind those eyes, but he’s also a man who carefully evaluates the people around him, and for those he chooses to ally himself with, there’s a bond of brotherhood that can be forged as if it were put through fire. Karma’s acceptance of Class 3-E, along with his personal character arc that relates to his friendship with Nagisa Shiota, reflect this quality strongly. Yuuko is someone who always keeps going, despite being a constant magnet of bad luck and downright unfortunate circumstances. She’s not the smartest or sharpest tool in the toolbox, but she is perhaps the one that is most admirable as she pushes onwards in her ordinary life, be it through silly games, poorly thought out jokes, or misadventures at a restaurant. Comedy, like life, ain’t easy. Like what you see here? Any thoughts on this post? Leave a comment! Pixar’s superhero family gets revisited in their classic first adventure. In an unusual break from AniB Productions’ usual schedule of shows and characters, we’re actually doing an animated film review! Yes, the timing to do The Incredibles is right. Not only is it my personal favorite film, it comes entering the final stretch before Incredibles 2 finally debuts, and I couldn’t be more excited. Truthfully, this review is also going to be a bit more contemplative on the context and details of the film, especially as The Incredibles is by now a very well-known quantity. I don’t doubt some people might still not have seen it all these year later, but this review’s going to have spoilers- and I don’t regret that one bit. So here’s a look one last time at Pixar’s first family of supers before they return for their long-awaited debut, with a special review of The Incredibles! From the first moment Michael Giacchino’s first notes of a wonderfully jazzy score hits your ears to the final note of “The Incredits”, this was a film that created an enrapturing world into the age of the silver age superhero…and the challenges of suburban life as a normal family, albeit with superpowers. The film came in the footsteps of Pixar’s previous successful endeavors, including the prior year’s Finding Nemo (2003) and Monsters Inc. (2001), and would go on to be an important part of the studio’s absolutely dominant decade in the animation medium- a period that saw the modern animation giant grab an unprecedented 6 out of the first 10 Best Academy Awards in Animation, including this film. Before we delve into The Incredibles as a film though, consider the circumstances in which it emerged, which were wonderfully unique. First off, the movie released in a time before the superhero deluge of the last decade or so emerged, which in turn allowed these brand-new characters to thrive in that niche. Then there was the year itself: 2004 proved to be an unremarkable year in animated film fare aside from this wonderfully complex tale of a hero family, featuring competition like Disney’s Home on the Range (which actually can tie into a greater story about how that point was around that studio’s nadir, but we’ll save it for another time), The SpongeBob Squarepants Movie, billed as the “finale” to the flagship show of Nicklelodeon’s, except that it wasn’t, Shrek 2, which while arguably the second best film of that franchise, didn’t exactly have a high bar to clear in retrospect as that series began a prolonged decline for DreamWorks, and Shark Tale, the studio’s other film from that year which a) featured Will Smith as a talking fish and b) was utterly inadequate compared to the aformentioned Finding Nemo that had proceeded it as an “animated fish film.” When looking back on these other films, it may become easier to begin seeing why Pixar was so dominant at that time, and the massive chasm other animation units had to overcome in improving their films up to a certain standard, which in reality was a good thing- as animation can be a wonderfully deep and complex medium through which a story can be conveyed, not merely fodderized to the tune of “kid’s movie.” Such a mere descriptor did not do The Incredibles justice. Indeed, The Incredibles was uniquely layered to tell a different story to any member of its audience at that given moment in time- from Mr. Incredible’s mid-life crisis, to Mrs. Incredible’s pressure at being a good mother and faithful wife; Violet’s teenage shyness and very apt name as she grew from a “shrinking violet” into a blooming flower with her confidence and self-assertiveness through the film, and Dash, who yours truly at the age of 10 related perfectly at the time to a kid frustrated at not being able to show off his true talents, but also with a side of mischievousness that added levity to high-pressure situations. While the family is definitely compelling with a wholesome dynamic often absent in films that makes it all the more refreshing that it exists here, I actually wanted to devote some time to the one major character who won’t jump from the original film to the new iteration, and that of course is Syndrome. Syndrome was a pretty well-constructed big bad for the film with a compelling, if straightforward origin story inflated to the extreme. The one-time Mr. Incredible fanboy as “Incrediboy,” a massive childhood obsession for Buddy Pine turned sour after a fateful night for all parties involved, and feeling rejected by his hero, he turned it into an insatiable and clearly unhinged plan for revenge over many years. While the film leaves a lot to the imagination, Pine clearly continued to develop his prodigious talent as an inventor in the intervening years, and was also successful enough in developing weapons technology that he became incredibly wealthy, buying and transforming Nomanisan Island into his own personal base and testing ground equipped with state of the art facilities and technology to carry out his “Operation KRONOS” plan. The dark truth behind Syndrome’s identity isn’t too hard to figure out once his adult self makes his explicit debut on screen with his perfected Omnidroid prototype, but it does make for an impactful moment when Mr. I discovers the secret computer storing the data of the villain’s diabolical scheme- and confirms the sinking suspicion that old heroes forced into retirement by the government were in fact test sacrifices to build the perfect super-proofed robot of doom. Vindictive, smart and with more than a healthy dose of deep-seeded, misguided hatred at the figure he once idolized, Syndrome’s dreams come crashing down ironically at the hand of his own perfected doomsday machine, and then perhaps even more profoundly, by Jack-Jack Parr, who represented the youngest of the new generation of heroes the man worked so hard to destroy once and for all. As The Incredibles gets set to debut to a whole new generation of viewers, the original film has and will remain a timeless classic in the art of animation and filmmaking, and continue to be one of Pixar’s brightest films as time continues to move on. It’s exciting to see a revival of the franchise, but it’s also great to know why a sequel was so highly anticipated, and more than anything, that it was an incredible movie. Animation Quality: This film looked great for 2004 and still looks good now. Since 3-D animation has tended to take exponential leaps since it began to be used in the early 90’s, this film looks remarkably good for something nearly 14 years old at the time of this writing. As you’d expect, Pixar’s films are eye candy, and this brings your convincingly into this compelling world, from the classic cityscape of comic books, to the middling feeling of 50’s-esque suburban planning, and even to the lush backdrop of a tropical island containing a diverse self-contained biome interwoven with the underbelly of Syndrome’s operation. 4.75/5 points. Characterization: If it wasn’t obvious from the title, watching the film, or my thoughts above, this film is about the Incredibles family and the various personal challenges they work through during the film in order to come together and thwart Syndrome’s master plan. Mr. Incredible, real name Bob Parr, is a man who pines for the glory days of his youthful prime as a hero before the government decided to push the idea of a hero society underground. (Ironically, this is essentially the opposite of the world established in the current anime My Hero Academia, but that’s another discussion entirely.) Stuck in a desk job at a big corporate insurance agency, he’d become an overweight, unhappy man who despite having a still intact sense of justice and heroism, is repressed from doing the one thing in his life that gave him meaning…while not always noticing the family who has grown with his waistline over the years. Still, Bob is a good family man, husband and father, and his best interests at heart intersect in his mind with what’s good for his family. That vision is challenged through the film though…Blessed with the power of super strength and enhanced agility/reflexes, his power on the battlefield is no joke. The kids don’t actually play huge roles compared to their mom and dad, but they do have significant moments and character growth that is all their own worth mentioning. Violet of course comes into her own as a young woman; while her invisibility power tends to be the one she favors, especially when timid, the confident Violet gains control over using her force fields properly, which prove even strong enough to (temporarily) hold off the full weight of the perfected Omnidroid in the final battle. Along with a change in personality comes the subtle but age-old symbolism of a change in how she wears her hair; formerly hanging in her face, it becomes pulled back, figuratively “opening” Violet up. Dash is a little spitfire: a 10 year old with excess energy and the speed to match. He is proud of his speed superpower and wants to show it off, which causes him a lot of trouble from his mother, who simply wants the family to keep a low profile. Dash is finally unleashed upon Nomanisan Island, where he finally gets to run to his heart’s content…in life and death battles. The other two major allies of the Incredibles are Frozone, real name Lucius Best, and Edna Mode, a top-flight fashion designer who specializes in hero suits (“No capes!”). Both are known for being quip machines in relation to how they are referenced in pop culture, but Frozone is Bob’s best friend and an important ally (as a hero who generates ice by freezing water particles in the air) and Edna literally creates the now- iconic hero outfits for the family. Add in that they’re voiced by Samuel L. Jackson and director Brad Bird himself, and both characters are a lot of fun. Syndrome I spoke about at length already, but to reiterate: he’s an excellent memorable villain who has just the right motivation, infrastructure and smarts to feel like a properly viable threat, along with a cutthroat ruthlessness that is territory animated films don’t normally deal with. (I mean, the man wanted Mirage, his personal assistant, to shoot down a plane with a mom and her kids aboard because they entered his airspace…and then used it to crush Mr. I’s hope. Great writing stuff there.) 5/5 points. Story Quality: The tale of Mr. Incredible’s heyday, fall, comeback attempt and redemption forms the main arc of the story, but this is a tale actually about the whole family and so it asks the question “what happens if I put the family dynamic into this repressed world of superheros and suburbia?” What’s even more innovative is that the family actually saving the day at the end is in reality a series of misadventures and improvising, from Mr. I’s misguided foray into thinking he needed redemption as a hero and a man while forgetting his family idolized him; Mrs. Incredible’s solid attempt to be the glue that binds the family together leading to an unlikely island rescue that involves the whole family unintentionally (save Jack-Jack); and Syndrome’s own hubris being his downfall in the midst of a clearly well-developed and complicated plot years in the making. There’s a lot more aspects to this film’s story than that, and darker elements as well too (hero test subjects, for one), which makes for a richly compelling film that insists you get something new out of it with each viewing. 5/5 points. Themes: If it wasn’t obvious before, family, family, FAMILY! The Incredibles was able to actually turn this important, if rote topic, into something innovative and original; the classic American family re-imagined in a story of heroes and villainy that makes for high drama and great adventure, along with the wholesome message that can be imparted to younger viewers. Inside that basic overarching idea though, there was riffs on mid-life crises, the pressures of adolescent socialization, the idea of revenge gone too far and the mistakes of the past not being recognized until far later. Each time you watch the film, something new can spring into your mind (take the jab at corporate bureaucracy and the pressure of results over helping customers when Bob encounters his boss as one of those thoughts.) Not many films do that- and I’m not just talking about animated fare. 5/5 points. Don’t Insult the Viewer: This film has all the jam-packed action and drama of a top-notch hero film without the crassness of some, and brings its own unique family dynamic to the picture. The score of this film is also jazzy heaven; it brings to life the atmosphere and storytelling of the film and remains a welcome listen to this day even as an OST. It’s a superb family experience that will find resonance with mostly everyone. 5/5 points. Overall: 24.75/25 (99%). Do I think there’s such a thing as a “perfect movie?” In theory, yes, but The Incredibles will have to settle for being just one of the better films you’ll see, especially in its genre. It’s worth a revisit before the new film drops, and will continue to be re-watchable for years to come.